Monty Roberts, Jan Fennel, Pat Pirelli, Cesar Milan, rightly or wrongly have a forged a place in the modern training world. All these training methodologies have common ground, all purport to supporting your training and learning needs, you can watch their shows, read their books and follow them on social media, but the one thing they all have in common is that none of them expose the methodology behind their training i.e. what goes on behind the scenes to uncover the essential elements of understanding and working with the individual behaviour of the species. Every human, every animal, every group, flock and herd have underlying factors that influence your thinking and working rationale to achieve outcomes. There is no mystery, it's not necessarily common sense but, instead of hiding the methodology, glamorising it and capitalising on it Animal Transactions shares the methodology to it's fullest extent in easy to understand bite sized elements. This enables the handler / trainer / professional to get a grasp of the basics behind behaviour and to understand the building blocs to apply it in unique environments to get the most from the technique in the safety of the training environment and out in the field. Whether loading horses into a trailer or tacking up, getting dogs used to car trips, desensitising for innoculations or treating giraffes for applying topical ointment our methodology applies across species and trainers alike. 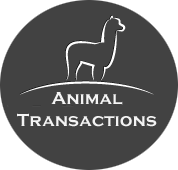 In simple to follow processes you can achieve just about anything through Animal Transactions training methodology.